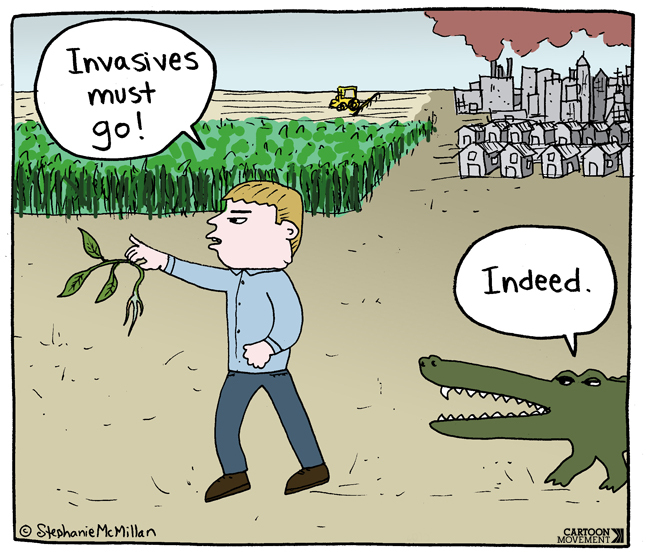 The terms “invasive” or “invasive species” get thrown around a lot. They are frequently used to describe anything that is “misbehaving,” or acting in a way that doesn’t fit our idealized vision for how a landscape should look and function. Oftentimes a species that is introduced (by humans) or is not native to an area automatically gets labeled invasive, even if it isn’t acting aggressively or having any sort of dramatic impact on the ecosystem. 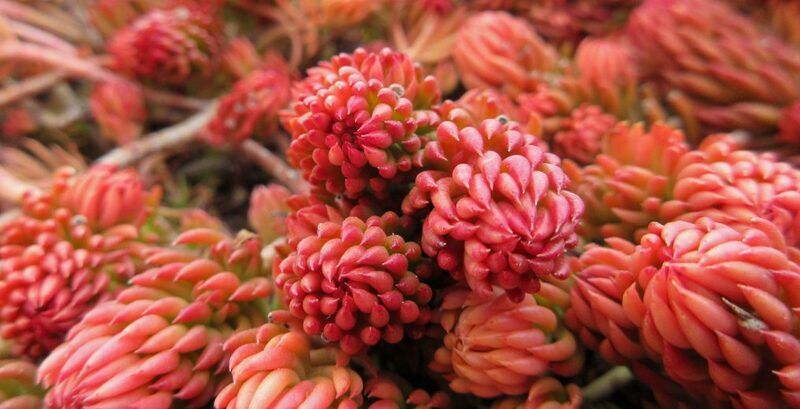 It is an alien species in an alien environment; it has invaded, therefore it is invasive. Determining what is actually invasive in what location and at what time is much more complex than that. We do our best to understand the natural features and functions of ecosystems, and we single out any species, whether introduced or not, that is acting to upset things. That species is considered invasive and, if the goal is to restore the natural balance, it must be controlled. To what degree a species should be controlled depends on the degree that it is upsetting things. 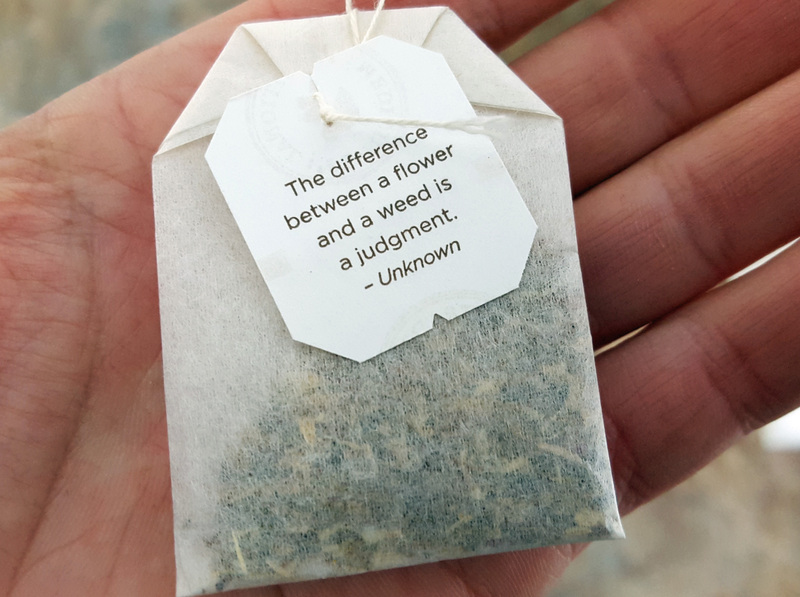 Ultimately, it comes down to human judgement. Hopefully that judgement is based on the best available evidence, but that isn’t always the case. “Invasive species” is often used inappropriately to refer to any species that is found outside of its historic native range (i.e. the area in which it evolved to its present form). More appropriate terms for such species are “introduced,” “alien,” “exotic,” “non-native,” and “non-indigenous.” The legal definition of an invasive species (according to the US government) is “an alien species that does or is likely to cause economic or environmental harm or harm to human health.” Even though this definition specifically refers to “alien species,” it is possible for native species to behave invasively. These terms refer not just to plants but to all living organisms. The term “noxious weed,” on the other hand, is specific to plants. A noxious weed is a plant species that has been designated by a Federal, State, or county government as “injurious to public health, agriculture, recreation, wildlife, or property.” A “weed” is simply a plant that, from a human perspective, is growing in the wrong place, and any plant at any point could be determined to be a weed if a human says so. Humans have had major impacts on virtually every square inch of the planet and have been placing our fingerprints on every ecosystem we touch since long before we became the humans we are today, and so it is difficult for me to envision a planet sans humans. It is also difficult for me to buy into the idea that our planet should look as though humans haven’t touched it (i.e. pristine). Because we have been touching it – for hundreds of thousands of years. Efforts to rewind time to before introductions occurred or to hold an ecosystem in stasis, securing life for only those species that “belong” there, seem noble yet fanciful at best and misguided, arrogant, and fruitless at worst. To be the best conservationists we can be, we probably need to find a middle ground regarding invasive species – not a deter and eliminate at all costs approach, but also not a complete surrender/all are welcome and all can stay stance. Somewhere in between seems reasonable, acknowledging that the strategy taken will be different every time based on the location, the species in question, and our objectives. Of course, none of my beliefs or opinions on this topic (or any topic for that matter) are fully formed. I am trying to do my best to maintain an open mind, seeking out the best information available and following the evidence where it takes me. A topic as complex as invasion biology, however, is never going to be easy to finalize one’s opinions on, and so this journey will be boundless. I hope you will join me. As the human population balloons and cities sprawl, ecological studies in urban areas are following suit. Nature has always been a component of cities – we can’t escape it after all, as hard as we may try – but urban nature (and the enhancement of it) has become increasingly important as the human species continues to urbanize. More and more we are seeing the importance of melding the built environment with the natural one. Our motivations are diverse – albeit largely anthropocentric. But that’s fine. As we make improvements to the live-ability of cities for human’s sake, other living beings benefit. We are finding ways to get along with our neighbors, and we are learning to appreciate and value them as well. Since 2008, the world’s urban population has outnumbered its rural population, and it is predicted that by 2050, more than two-thirds of humans will be urbanites. Immense resources are required to support such large, concentrated populations, and most of these resources are produced outside of urban areas. 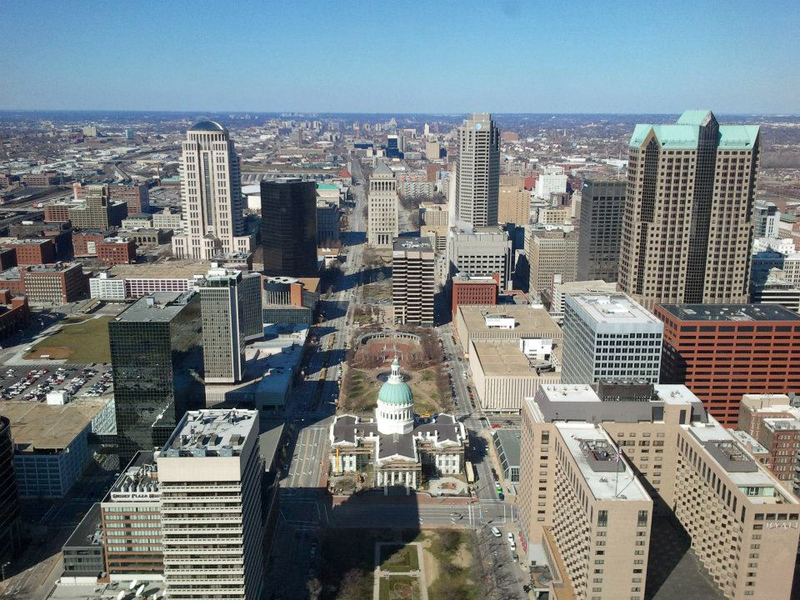 This results in an ecological footprint that is significantly larger than the city itself. Additionally, waste and pollution produced within cities negatively effects surrounding areas and beyond in abundant ways. In May of this year, Science put out a special issue entitled, “Urban Planet,” which features a series of articles that address some of the latest research in urban ecology and discuss current developments and future research needs – a sort of state of the union address for urban ecology in 2016. A series of 13 articles covered diverse topics including city-integrated renewable energy, innovative solutions to water challenges, transportation and air pollution, and food security in an urban world. Rodent-borne diseases in urban slums, creating sustainable cities in China, and Vancouver’s push to become the “greenest city” were also features of this special issue. 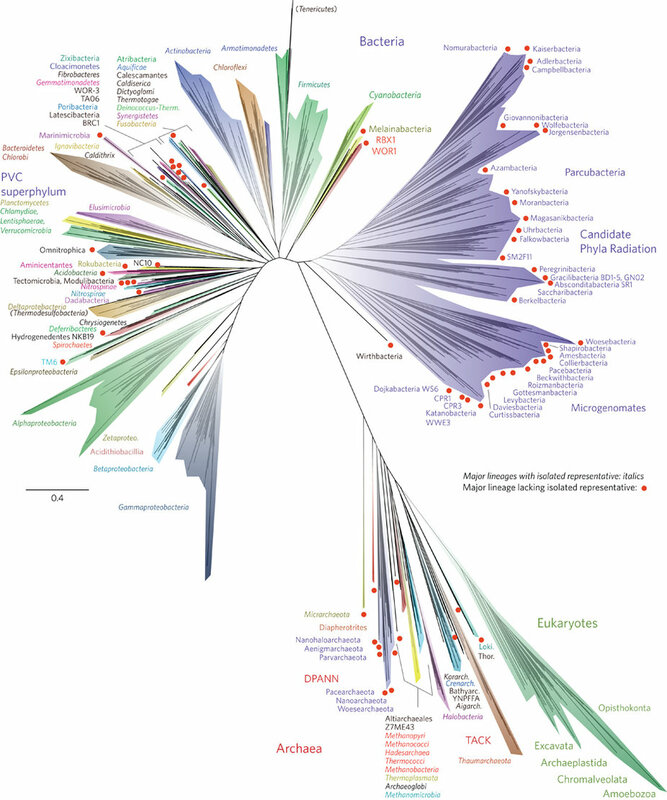 Studies in urban ecology have also increased our understanding of the mechanisms involved in evolution and adaptation. To illustrate this, the authors offer examples of birds that modified their songs “to communicate at noisy locations” and plants that shifted their seed dispersal strategies to survive in “highly fragmented urban habitats.” The authors also highlight the importance of maintaining or restoring natural vegetation in urban areas in order to help preserve struggling species of plants and animals, citing a study that found that “fewer local plant extinctions occurred in cities that maintained at least 30% native vegetation cover.” Additionally, the authors note that “the scope of urban ecology research extends well beyond city limits,” since urbanization is partly to blame for numerous environmental issues including habitat loss and fragmentation, biodiversity loss, climate change, and invasive species. 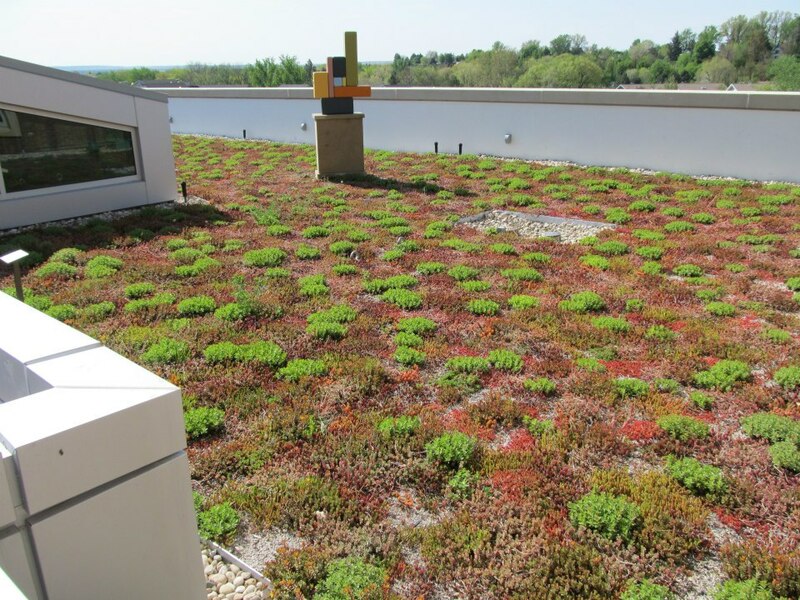 Green roofs are one way to add green space to urban areas. They help replace vegetation that was removed when buildings were constructed, and they offer numerous environmental benefits. This special issue of Science highlights some of the current ecological and environmental research regarding urbanization. For a great introductory look at urban ecology and basic ecological principles, check out the book, Nature All Around Us. Also, expect to see many more urban ecology themed posts on Awkward Botany. Tell your friends. To kick off this year’s American Wetlands Month, I am reposting something I posted three years ago. I have updated the links and added a few more resources. In celebration, all Awkward Botany posts in May will have something to do with wetlands. An underlying goal of American Wetlands Month is to encourage people to get out and visit wetlands in their area and find out what they can do to help conserve them. Hopefully this series of posts helps to further that aim. Wetlands are ecosystems that are characterized by their vegetation (aquatic plants), their soils (formed during anaerobic conditions caused by being flooded or saturated with standing water), and, of course, their state of being largely saturated with water either seasonally or permanently. Examples of natural wetlands include bogs, fens, marshes, and swamps. 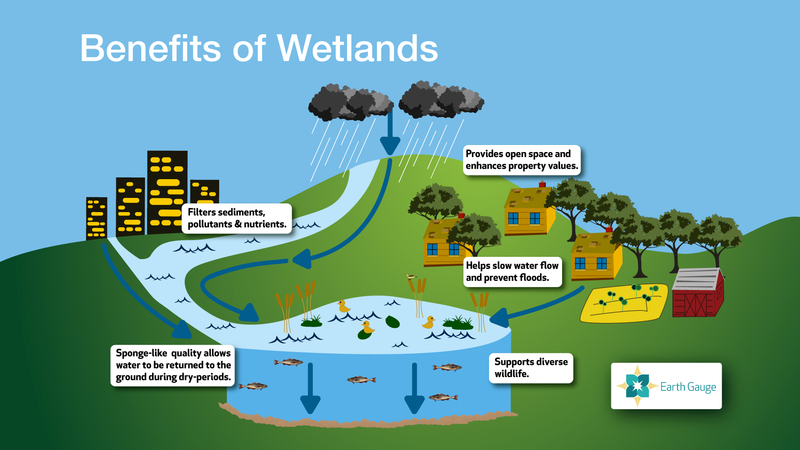 Wetlands can also be constructed by humans for the purpose of collecting storm water runoff from urban areas in efforts to reduce the risk of flooding and avoid overwhelming municipal sewer systems during large rainstorms. Wetlands are the most threatened type of ecosystem on earth, and we are losing them at a steady clip. Major threats to wetlands include land development, pollution (agricultural, commercial, residential, etc. 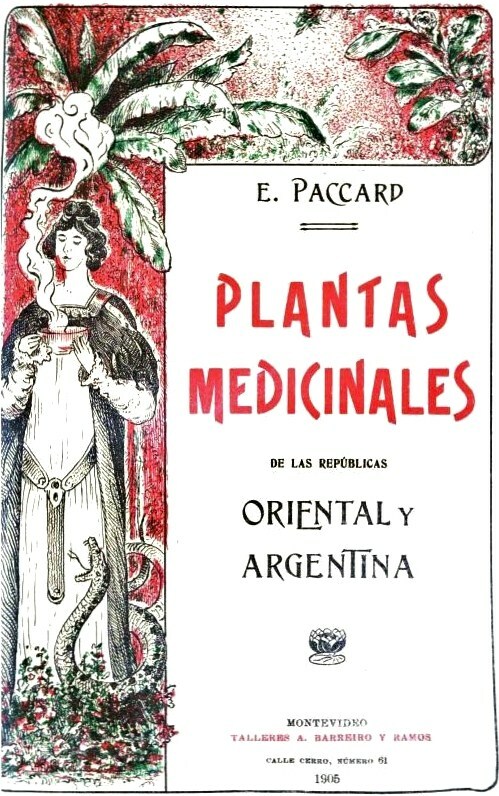 ), and the introduction of invasive species. Considering the benefits we receive from having wetlands around, it is imperative that we protect them. Earth Gauge offers some suggestions on how to do so. Speaking of wetlands, one of my favorite wetland plant species is marsh marigold (Caltha palustris). It is in the buttercup family (Ranunculaceae) and is common throughout the Northern Hemisphere. I became familiar with this plant when I was volunteering at a wetland in Edwardsville, IL. Perhaps you’ve seen it growing near you. 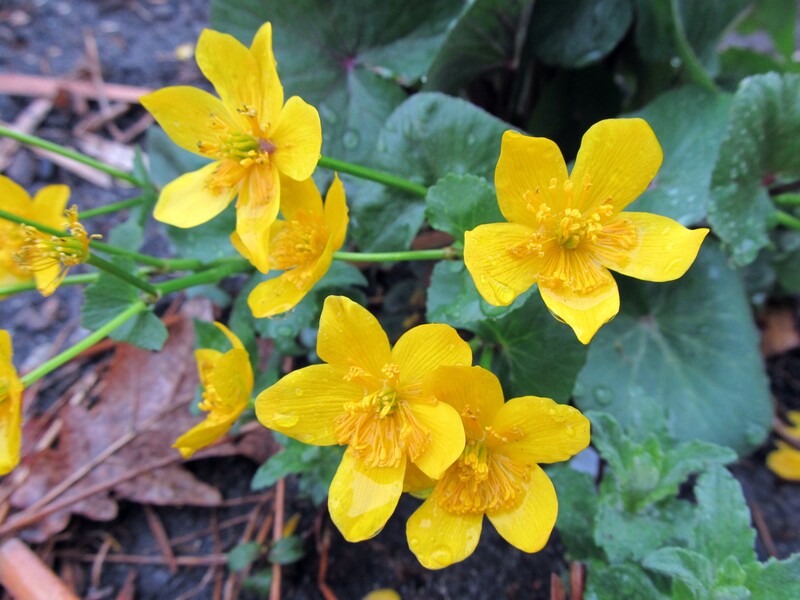 Marsh Marigold (Caltha palustris) – Photo taken at Idaho Botanical Garden.